Alpha Conde, the main political rival of ailing Guinean President Lansana Conte, returned to Conakry this weekend after two years abroad, and received a rapturous welcome from thousands of people, angry about rising food prices and poor living conditions in the West African nation. Conde, the leader of the main opposition party Guinean People's Rally (RPG), stood against Conte in Guinea's first multi-party presidential elections in 1993. In the run-up to the 1998 poll, where he was again the sitting president's main challenger, he was arrested near the Ivorian border and charged with recruiting mercenaries and plotting to topple Conte. The opposition leader spent two and a half years in prison before being pardoned by presidential decree. But he was banned from any political activity and headed into self-imposed exile in Paris. 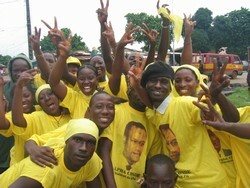 On Sunday, Conde returned to the Guinean capital Conakry, to the delight of thousands of RPG supporters who lined the road from the airport, wearing yellow party T-shirts emblazoned with his portrait. "I couldn't miss this opportunity," said one supporter Fanta Kaba. "Now our situation will improve. We are being governed by a band of incapable men at the moment." The crowds seem to agree. "We are hungry, Alpha Conde, do something," they chanted. The price of rice, Guinea's staple food, is once more soaring beyond the means of ordinary people. A 50 kg bag of rice on the free market has almost doubled in the last year to 100,000 Guinean francs (US $22) -- about half the average monthly salary of a civil servant. And it is not just food prices that have shot through the roof. Fuel prices rose by 55 percent in May with an immediate knock-on effect on public transport prices. Trade unions reacted by demanding a four-fold increase in wages. Meanwhile, inflation is rising fast, further sapping the meagre earning power of those Guineans lucky enough to have a job. According to the International Monetary Fund, inflation was running at 28 percent in April up from single digits two years earlier. And tensions are mounting in this country where half of the eight million people live on less than a dollar a day. Police officials said two trucks carrying rice and escorted by gendarmes were attacked late on Friday by bands of youths, prompting the main market to shut down on Saturday. The weekend attacks recalled the more widespread disturbances of last July, when several hundred people looted rice trucks in downtown Conakry and gangs of youths went on the rampage, threatening to break car windscreens unless drivers gave them money. Conte, who suffers from acute diabetes and can no longer walk unassisted, pleaded with market traders last week to reduce their prices and his appeal seems to have been heeded. The rice traders' association on Sunday announced that a 50 kg bag of rice would now be sold at 75,000 Guinean francs (US$ 17). "I implore you retailers to sell at the new price, if you are to avoid the wrath of the hungry population," Mamadou Diallo, the association's secretary-general, said in a statement. The traders had told Conte last week that their prices were so high because there was no foreign exchange available from the central bank at official rates, so they were being forced to buy hard currency at inflated rates on the parallel market. The unofficial rate has jumped from 2,800 Guinean francs per US dollar to 4,450 in the last year. Diallo said on Sunday that the government had agreed to provide importers with foreign currency through commercial banks. But it remains to be seen whether the new fixed rice prices will be enough to douse public anger. Conte tried a similar tactic in 2004 but without long-lasting success -- prices shot back up and 100 local government officials were subsequently fired. It is against this potentially volatile backdrop that opposition heavyweight Conde has returned. "By your numbers you have demonstrated that when the RPG stands up, it is the entire population in this country that stands up," Conde told the crowds on Sunday. "Some said the opposition was dead, others said we were a tired bunch. But today you have demonstrated to the world that the opposition is alive and vibrant. Together we can save this country as there has been too much suffering," he added. Party officials told IRIN that Conde, in his late 60s, had returned from Paris to organise his party for municipal elections, due during the last four months of 2005. Analysts warn that successful municipal elections are essential if Guinea is to avoid becoming West Africa's next failed state. In a report on Guinea last month, the International Crisis Group stressed the need for the opposition, which boycotted the last presidential elections in 2003, to re-engage for these local elections. "Opting out again would cost it legitimacy," said the Brussels-based think-tank. In the meantime diplomats, aid workers and UN officials worry about Conte's failing health and the possibility of a power vacuum. The president, now aged 71, is a former army colonel who came to power in a 1984 coup and has ruled ever since. Guinea contains a third of the world reserves of bauxite, the mineral ore refined to make aluminium. It also has gold, diamonds and large unexploited reserves of iron ore, as well as enough rain to give it vast agricultural potential. But diplomats and aid workers say that poor governance and rampant corruption have led to years of economic decline. According to the United Nations Human Development Index, Guinea is among the world's 20 poorest countries.